There is a danger in house churches that the leaders may not be grounded in Christian theology. They may not have Christian mentors or outside influences. We end up studying on our own. We talk to our own people. The leaders may not have anyone who is spiritually more mature mentoring them. This is a problem because we will fail to mature and grow and we may even drift off into unchristian beliefs and practices. How do we overcome this trend? There are many ways. We can read Christian books. We can attend Bible conferences. We can network and make Christian friendships with other leaders. We can begin attending a group Bible study with Christians that you would not normally study with. What about seminary? There are a lot of things we can do. Personally, I attend UBF Bible conferences, I attend the Midwest region UBF pastor’s meeting bi-weekly. I read Christian books and attend the weekly men’s group Bible study at #DeKalb Christian Church. I attend a nurses group Bible study made up of people from several different denominations. We recite the Nicene Creed and sing the Lord’s Prayer at every Sunday worship service. 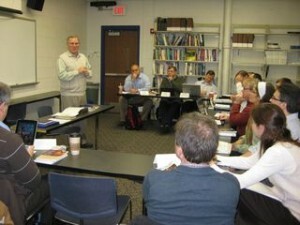 I just finished a 12 month cohort group with Dr #John Armstrong and #Act 3 ministry concerning Missional/Ecumenism. There were many books and outside speakers. It was led by someone who is not part of our ministry. I want to get my Master’s degree in the future in Christian ministry. UBF has asked an outside professor, Dr #John Armstrong of Act 3 ministry to mentor us in the development of our staff education program. As small, house church ministry leaders, we must never let ourselves get insular or spiritually “inbred”. We must grow and mature with the greater body of Christ and have a well rounded faith. We need mentors. May these links be the beginning of a lifetime of learning for you and all who worship with you.